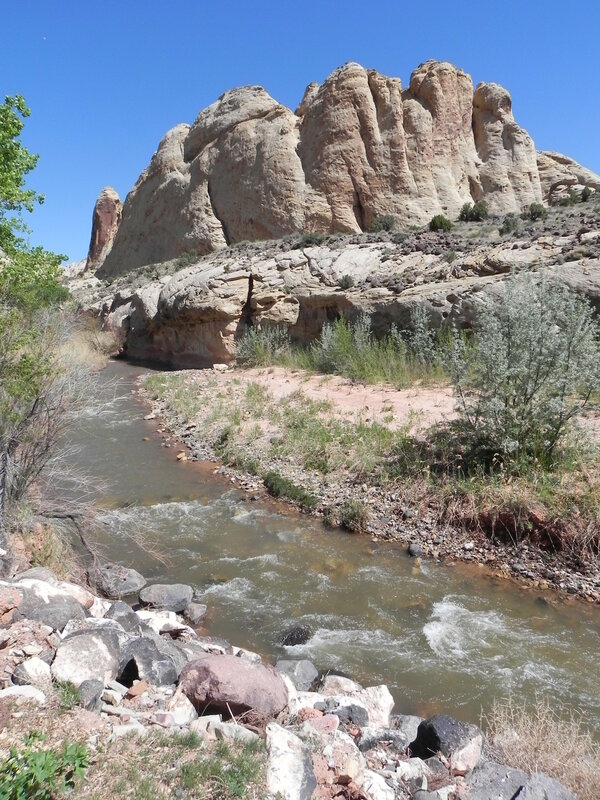 In all probability, most of our readers have never even heard of Capitol Reef National Park. Where’s that? you may wonder; if it’s anywhere most likely it’s some island park somewhere in the Pacific or Atlantic oceans. Instead, it’s situated in one of the driest sections of our nation. It came by its name because early pioneers in westward-bound wagon trains felt its topography (featuring many dome-like sandstone rock formations) reminded them of the Capitol dome in Washington, D.C. Secondly, because it had been, since time immemorial, a 100-mile-long reef-like obstruction to east/west traffic. Indeed, it ended up being the last-explored territory in the lower 48 states. Not until 1853 did an explorer even get close. But Captain John W. Gunnison, seeking a transcontinental east/west train route, never made it into the interior. Later that year, John C. Fremont, following upon Gunnison’s exploration, actually made it into the heart of the range. He was, in turn, followed by John Wesley Powell, who named the river running through it, the Fremont. Outlaw bands, such as Butch Cassidy and his gang are reputed to have hidden out in the towering wrinkle of rock, honeycombed with cliffs, canyons, knobs, monoliths, spires, slots, alcoves, arches, and natural bridges. Brigham Young sent Mormon pioneers to settle here in 1880. In a little two-hundred-acre river valley they named Fruita, they settled in, complete with a blacksmith shop, one-room schoolhouse, barns, and 2700 apple, peach, cherry, pear, and apricot trees. The little settlement lasted for sixty years—finally, the desolation, isolation, and loneliness got to them, and they moved out in 1940. Franklin D. Roosevelt first made it a national monument in 1937; it did not achieve national park status until 1971. 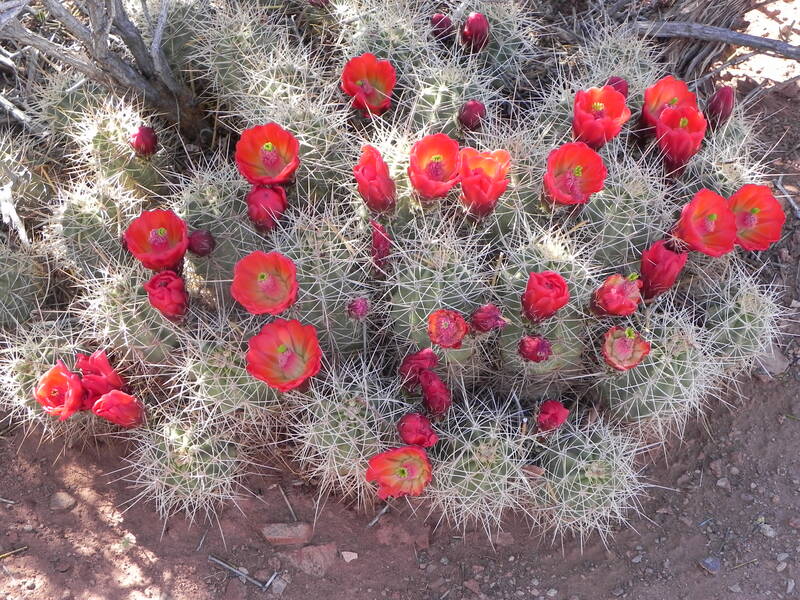 But relatively few visitors come here to explore its 241,900 acres; and of those who do, fewer yet venture off the two paved roads into the dirt roads of the interior, which is a pity, for they thereby miss some of the most magnificent scenery in the Southwest. Especially legendary are sections such as Upper Cathedral Valley, so monolithic early explorers likened many formations to Gothic cathedrals. Of the five national parks in Utah’s fabled Colorado Plateau, Zion gets the most visitors, by far; followed by Arches, Bryce, Capitol Reef, and Canyonlands. After a good breakfast at the Moab Best Western, we looped north on 191 to Interstate 70, headed west, then turned south on Hwy 24. Two mountain ranges so dominate southeastern Utah that rarely are both the La Sal and the Henry Mountains out of view. As for the Henrys, they rise like a great windjammer at full sail. Some years ago, in my faithful red Toyota I’d dubbed “Eloquent,” I’d driven here on a sabbatical. Foolishly, I’d taken Eloquent up into the Henrys; after crossing over the crest of the highest of the three Henrys, I all but lost Eloquent in the loose shale on the western side. Many the time I had to back up with spinning wheels, then race down in hopes I could get enough momentum to make it to the top of the next hill—again, again, and yet again. No cars at all on the road! I finally got back to Hanksville riding on fumes in an all but empty gas-tank. Now, as the Henrys came into view, I took a long lingering look at its now snow-capped peaks, stopped for photos, and we reboarded and headed west along the Fremont River to Capitol Reef, the Henrys our constant companions to our south. To say we didn’t do justice to Capitol Reef would be a gross understatement. We didn’t even have time in our tight schedule to take the nine-mile scenic spur (the only other paved road in the park). We only had time to shutterbug along the Fremont, in the Fruita orchards, at the schoolhouse, and spend ample time in the park visitor center. Anyone who fails to take advantage of the generally informative and sometimes splendid visitor centers in our national parks and monuments will later suffer for the omission, for those videos and films enrich your actual experiences and compensate for all you fail to see. We saw enough of the latter here in Capitol Reef to make us sigh and vow to return when we have the time—and four-wheel-drive—to enable us to venture into the hundred-mile north-south Waterpocket Fold that contains the park’s real treasures. 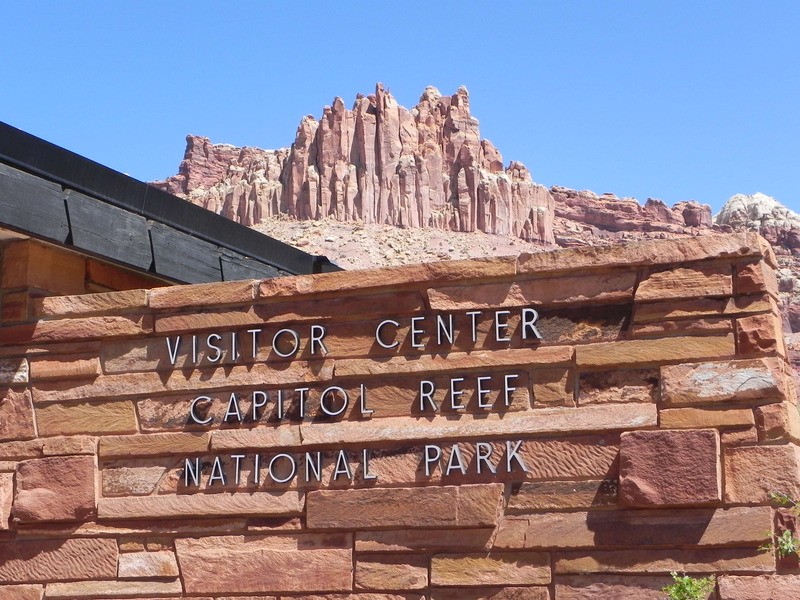 In one respect, Capitol Reef National Park towers over all other park visitor centers: the video footage comes to its memorable conclusion, the curtains slowly part and are pulled wide; behind: a magnificent panorama anchored by a castle-like fortress of rainbow-colored rock. It took our breath away! After delaying as long as we could, we reboarded the Lincoln and continued west. In no time at all, we’d exited the park. Next is Bryce National Park! Duncan, Dayton and Ken Burns, The National Parks: America’s Best Idea (New York: Alfred Knopf/Random House, 2009). Leeth, Dan, “Utah’s Forgotten Park,” featured in May/June 2011 AAA Encompass. Olson, Virgil J. and Helen, Capitol Reef: The Story Behind the Scenery (Wickenburg, AZ: K. C. Publications, 1990). White, Mel, Complete National Parks of the United States (Washington, DC., National Geographic Society, 2009). 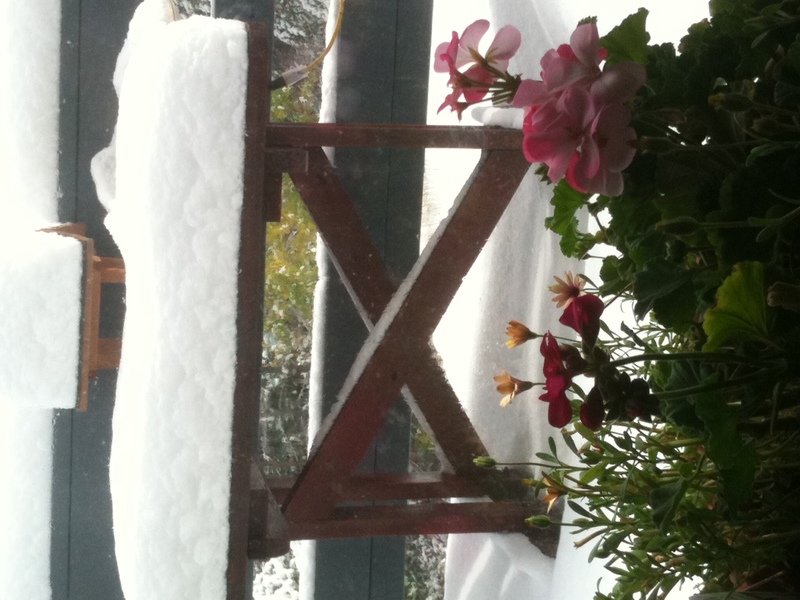 It snowed all night. We were up early, ate breakfast, then shivered as we scraped off the snow and ice from the car. Turned on the news, and it confirmed our suspicions: Don’t even try to make it through on Interstate 70. It’s closed. So it was that after we’d packed the car and taken photos of the snowcapped Stanley, we headed down Big Thompson Canyon. Northern route it would be. A pattern developed that would remain a constant: snow at higher elevations, rain in the lower. To save time, we cut across at an angle on Highway 287; only it almost cost us more time as the snow got so deep, the Lincoln not having snow tires, we barely made it through. Then it was out onto Interstate 80 in Wyoming; turned south on Highway 13, via Baggs, Craig, Meeker, and hit Interstate 70 at Rifle. From there on, it was clear-sailing. At a service station we learned we’d made the right decision: without either 4WD or snow tires, we wouldn’t have made it through Eisenhower Tunnel or over Vail Pass. I-70 was indeed closed. As we drove west on I-70, it was obvious that the Colorado River was running high. Shortly after we entered Utah, we made a snap decision: veering south at Cisco Junction rather than the usual Crescent Junction. Were we ever glad we did! Highway 191 out of Crescent Junction to Moab is so-so, but the Hwy 128 Scenic Byway is breathtaking! One of the most spectacular river drives any of us had ever taken. We hit it late afternoon when the colors were at their best. Towering up above the Colorado River were great bronzed cliffs, among them the Twin Fisher Towers, 1500 feet higher than the river. Moab has become the jumping-off place for all of South Utah, a far cry from what it was during the uranium boom of the 1950s—then it was a wide open boom town honeycombed with bars. Back even further, Cassidy’s Wild Bunch frequented it, and Zane Grey made Moab the scene for many of his novels! Many westerns have been filmed in this vicinity since then. Today, tourism is king, and the town has become the outdoor centrifuge for 4-wheeling, mountain-biking, hiking, white-water rafting, canoeing, horseback-rides, and cross-country skiing. Besides all this, it is also the hub for the twenty plus national parks and monuments in this magnificent desert country. We stayed at the Best Western Canyonlands. There are no historic park hotels in this part of Utah. If we’d learned one lesson from our Northwest Park Loop of 2010, it was to slow down. One day is too short a time to experience such national park wonders. Two days is too, but still better than one. Besides, if you stay two nights, you don’t have to repack every night—which really gets old on a three to four week trip. So it was that we stayed in Moab two nights. We also learned that, other than Moab, there are precious few motel or hotel accommodations in that part of Utah. Two people started the ball rolling here. In 1922, Alexander Ringhoffer, a prospector, was so impressed with the wild beauty of the area that he persuaded Frank Wadleigh, the passenger traffic manager for the Denver and Rio Grande Western Railroad, to come and see for himself. He in turn contacted Stephen Mather in Washington, D.C. When Mather came here and discovered for himself “the world’s largest collection of exquisite red stone arches—over two thousand of them—, “he was convinced they ought to be saved. He then enlisted the support of Dr. J. W. Williams and Lawrence Gould, who in turn put pressure on Utah Senator Reed Smoot. But Interior secretary Herbert Work balked, for Interior was downsizing rather than adding. In 1929, President Herbert Hoover and Interior Secretary Ray L. Wilbur stepped in and, by executive order, established Arches as a national monument. President Eisenhower reduced it in size, but President Lyndon Johnson increased it again. In 1971, President Nixon signed a bill making it a national park. In 1998, it was increased in size in order to bring in Lost Spring Canyon. Even so, at 76,519 acres, it is relatively small in area. Nevertheless, people throng here from all over the world. Few indeed see all 2,000 arches, but most see the park’s two crown jewels: the iconic Delicate Arch, which park officials claim to be “the best-known arch in the world”—it even graces Utah’s license plates. Probably only Monument Valley’s Rainbow Bridge could challenge its worldwide preeminence. 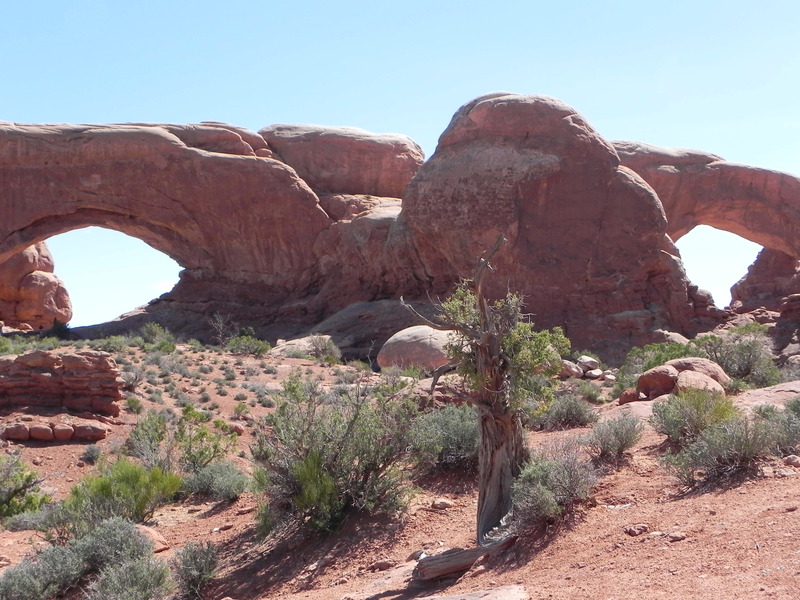 The other must-see is one of the world’s longest natural spans at 306 feet, Landscape Arch. But since it is only eleven feet wide (12 feet at its center), arch buffs fear for its future. For they remember that Wall Arch had stood here for thousands of years: in fact it was already curving gracefully when the Egyptian pyramids were under construction over 4,000 years ago. Yet, on Aug 5, 2008, Wall Arch simply collapsed. Then there’s Skyline Arch. Until 1940, a huge boulder blocked half its opening, then suddenly, after no one knows how many years of slow erosion undermining the boulder’s support, gravity won: the giant stone tumbled out of the arch, and Skyline Arch instantaneously nearly doubled in size. Other favorites tourists search out include The Three Gossips, Double O Arch and the Fins in Devil’s Garden, Double Arch in the Windows section, The Three Penguins, Surprise Arch, The Eye of the Whale, Balanced Rock and Chip-off-the-Old Block, Pine Tree Arch, North Window, Turret Arch, Sipapu and Kachina Bridges, Owachomo Bridge, etc. Arches is a place to return to, again and again. Nearby Canyonlands National Park, at 387,598 acres, is over four times the size of Arches. Though it is the largest national park in Utah, it is the least developed, the wildest; a landscape characterized by famed explorer John Wesley Powell as “a wilderness of rocks…with ten thousand strangely carved forms in every direction.” Powell also named such popular attractions as Cataract Canyon, the Dirty Devil, and the Labryinth. During the 1950s and 1960s uranium prospectors ran roughshod over this area. Bulldozed roads crisscrossed the landscape. But in 1964, no small thanks to Stewart Udall, President Lyndon Johnson signed legislation for the establishment of Canyonlands National Park. 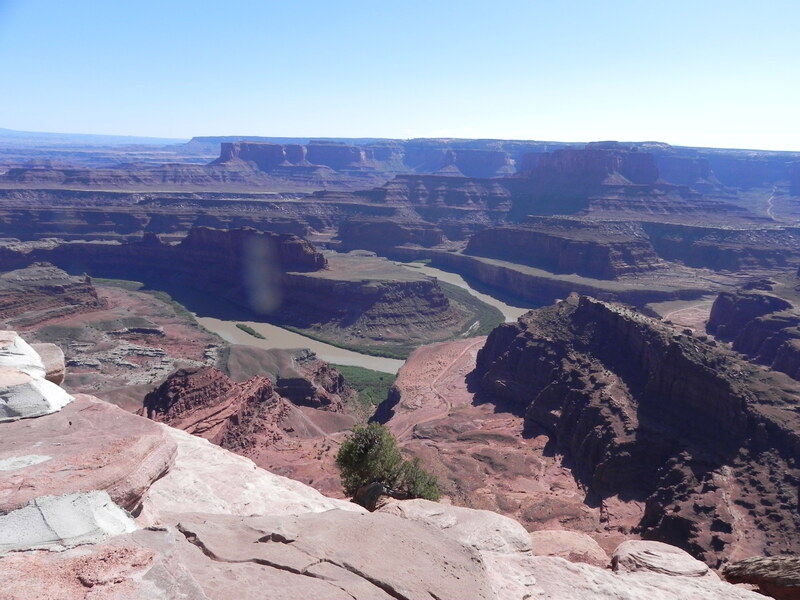 Mel White points out that while Canyonlands does have “some paved roads leading to spectacular views, most of the park is accessible only to hikers, boaters, and mountain bikers…. The positive side of this remoteness, of course, is the solitude, beauty, and adventure the park offers to intrepid visitors. Canyonlands protects one of the most unspoiled areas of the vast Colorado Plateau, a high desert region of stark rock formations, deep river-cut canyons, and sparse vegetation that receives less than 10 inches of rain in an average year. Two of the West’s iconic rivers, the Colorado and the Green, come together in the center of Canyonlands National Park. Their canyons, forming a rough “Y” shape, divide the park into three land sections. Between the two arms of the “Y” is a high mesa called Island in the Sky, 1,000 feet above the surrounding landscape and more than 2,000 feet higher than the site of the rivers’ confluence. 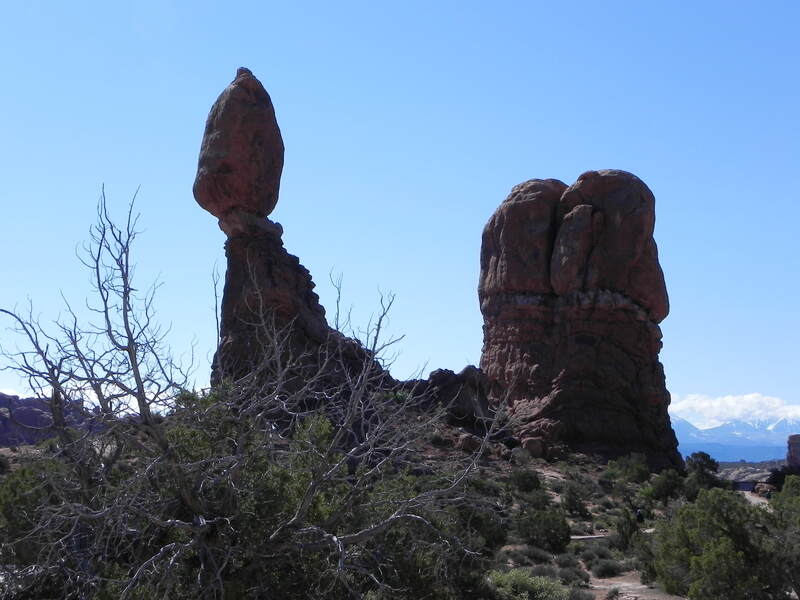 To the east is The Needles, a land of tall colorful sandstone pinnacles. To the west is The Maze, reachable from the other sections only by a long, roundabout journey involving unpaved roads. Because of the remoteness of The Maze, and time needed to reach it, most visitors spend at least three days exploring it. Park rangers, with good reason, describe the rivers themselves as the fourth section of Canyonlands” (White, p. 350). We made an early start for we were foolishly attempting to see both parks in one day. Our first stop was at the Arches Visitor Center. We have learned that visiting a park’s visitor center early on reduces the risk that we’ll inadvertently miss must-see portions of the park. As we crested at the top of a long steep hill, there in the east were the spectacular snowcapped La Sal Mountains (Utah’s second highest range). We stopped at popular sites such as Balancing Rock, Park Avenue, Three Gossips, North Window and South Window, Double Arch, and Turret Arch. This took all morning. In the afternoon, we moved on over to Canyonlands. After spending some time in the Island in the Sky Visitor Center, we walked out to the dramatic-looking Mesa Arch—a kind traveler took a group photo of us there. From there, we stopped at Buck Canyon Overlook and Grand View Overlook. And then we took the long side trip out to Dead Horse Point Overlook, one of the most photographed overlooks in America. From the highest point on the Island in the Sky Mesa, you can see a hundred miles into some of the grandest scenery on the planet: the snowcapped La Sal Mountains (over 12,000 feet in elevation) to the east, the Abajo Mountain Range to the south, and the Henry Mountains to the southwest. We were tired when we returned to our motel late that afternoon, for we’d packed a lot into one day; next time, we vowed we’d stay longer and see more within each park. Next Wednesday, we will move on to Capitol Reefs and Bryce Canyon. Arches National Park (Moab, Utah: Arches National Park, 2011). 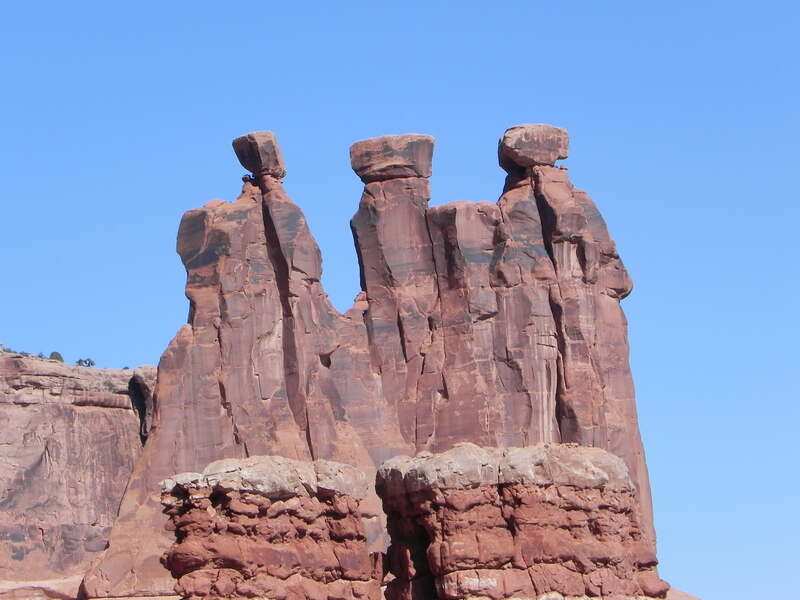 Johnson, David, Arches: The Story Behind the Scenery (Wickenberg, AZ: KC Publications, 2010). Johnson, David, Canyonlands: The Story Behind the Scenery (Wickenberg, AZ: KC Publications, 2010). The Most Scenic Drives in America (Pleasantville, New York: Reader’s Digest, Inc., 1997). Utah’s Canyonlands Travel Region (Moab, Utah: Utah’s Canyonlands, 2011). Utah’s National Parks and Monuments (New York: American Park Network, 2009). White, Mel, Complete National Parks of the United States (Washington, D.C., National Geographic Society, 2009). If the truth must be told, I almost chose Dickens’ Christmas Carol as our December selection, but had second thoughts because Connie and I concluded that most of you would have already read it. If it should turn out that you have not, I have a suggestion: In such a case, since both The Christmas Carol and The Christmas Angel are quick reads, I suggest that you read Dickens’ great classic first, for all modern Christmas stories graft on to Christmas Carol. 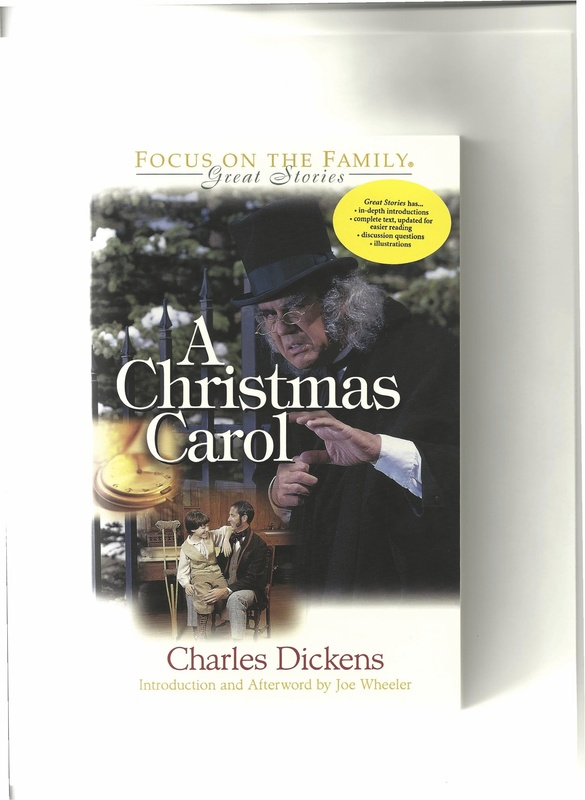 I was privileged to partner with Focus on the Family and Tyndale House in twelve classic books: Louisa May Alcott’s Little Women (1997) and Little Men (1999); Daniel Defoe’s Robinson Crusoe (1997), and The Farther Adventures of Robinson Crusoe (1999); Lew Wallace’s Ben-Hur (1997), Henryk Sienkiewicz’s Quo Vadis (2000); Grace Richmond’s The Twenty-fourth of June (1999); Gene Stratton Porter’s Freckles (1999); Lucy Maud Montgomery’s Anne of Green Gables (1999); Abbie Farwell Brown’s The Christmas Angel (1999); and Charles Dickens’ A Christmas Carol 1997) and David Copperfield (1999). For each of these I wrote a modest biography of the author (averaging 60 – 80 pages in length) as well as discussion questions placed at the back of the book for individual readers, parents, teachers, and homeschoolers. And we featured the oldest or best set of illustrations we could find. I cannot remember when I first heard it read . . . nor when I first read it . . . nor when I first experienced it on film . . . nor even when it first engulfed me as live drama. . . . I only know that looking back through life, somehow — I know not how — Christmas Carol was always there. In the annals of literature there is nothing like it. Certainly there was nothing like it before Dickens wrote it in 1843 — since then, many have tried to imitate it. But the great original still stands, alone and inviolate — the Rock. Can Christmas possibly be Christmas without it? Many there be who would answer in the negative: somehow, to conclude even one Christmas season without re-experiencing the story would be to leave that year incomplete. In the century and a half since it was published, we have come to take it for granted: we just accept it as if it had always been with us: like Wise Men, creches, and holly. What would the world, after all, be like without Scrooge, Marley, the Cratchits, the Three Ghosts, Bah! Humbug! and Tiny Tim? Well, in the year of our Lord, 1842 — none of those yet existed. So what was 1843 like for Charles Dickens? Simply and succinctly put: not good. It was about time for it to be “not good.” Let’s step back in time — and I’ll explain. As we can see in the bio, Dickens endured a tough childhood — a mighty tough childhood. Then, at the age of 25, he was catapulted to the top of his world. It is always dangerous to soar too high too young: it usually results in a strong case of King of the Mountain hubris — unless the 25-year-old is strong and wise beyond his years; unless he realizes, with Nebuchadnezzar, how quickly the God who giveth can become the God who taketh away; even more importantly, unless he realizes that, in life, nature ‑‑, and apparently, God ‑‑ abhors long plateaus. In other words, today’s Success is already unrealizingly sowing the seeds of its own destruction. This was true with Dickens. He had assumed, as had that great Babylonian king before him, that he had become king and great all by himself ‑‑ by the sheer brilliance of his mind and force of his will. Both of which he had an oversupply of. Perhaps a baseball analogy would help. In 1836, he stepped up to the plate, and hit Boz out of the park. Next, he hit Pickwick out of the park. Then Oliver Twist, then Nickelby, then The Old Curiosity Shop, then Barnaby Rudge, which just cleared the outer wall. Then came his ill-fated trip to America, and when his bat made contact with American Notes, he only hit a bloop single, not even realizing that he now had a hairline crack in the bat. That was followed by Martin Chuzzlewit ‑‑ and with it, he broke his bat. For the first time in seven years, he was in trouble. He had mistakenly assumed that, being King of the Hill, he could say anything he darn well pleased. That he could travel to the late great colony of America and noblesse oblige himself all over the place. Since Americans were too cheap to pay him his due royalties, he could just tell them where to go. To put his condition in modern vernacular, he had an attitude problem. Even his countrymen felt, this time, that he had gone too far. The result: the golden faucet ‑‑ that had gushed its riches upon him for almost seven years ‑‑, now slowed its flow so much he wondered if perhaps his well was going dry. Even worse, what if it was dry? What if people would no longer buy his books? Dickens was never much of a humble man: he knew to a penny the value of his gifts. Or had known prior to 1842. Now, he didn’t know any more. Well, what could he write that would improve his fortunes, and help bring back his fickle audience? Something he could write quickly, not just another two-year book serialization. So the idea for Christmas Carol came to him (see bio). For a month and a half he totally immersed himself in the world of Scrooge. In the process, he gradually became aware that, somewhere along the way, he had become a Scrooge himself: had felt himself so secure in his gifts that he no longer needed other people, that he no longer needed to really care (not just abstractly, but one-on-one) about human need. In the course of writing the story of Scrooge, Dickens was able to pull himself back from the brink, to realize his need of others. He began to wonder if he any longer knew ‑‑ or if he ever had ‑‑ who he really was. Could he even know without going backwards in time? 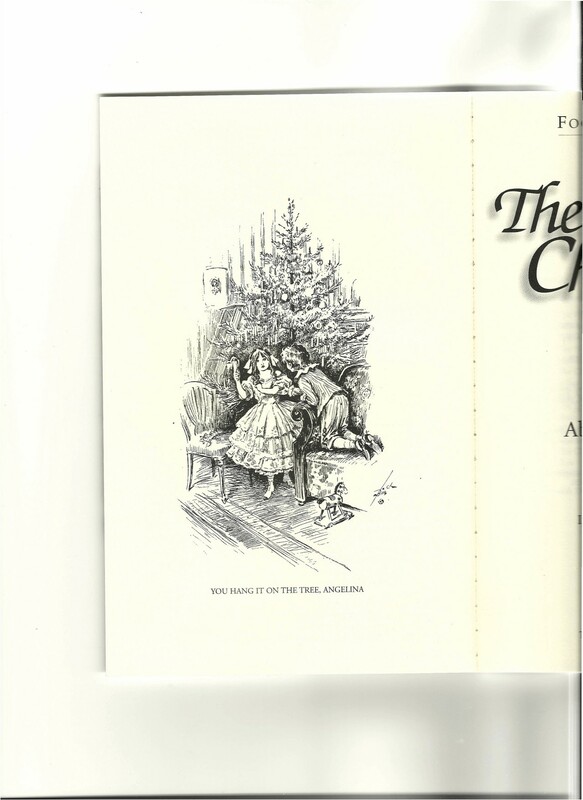 The answers to those questions were a long time in coming, but A Christmas Carol was the first step, the four other Christmas books represent additional steps, but the biggest steps were Dombey and Son, David Copperfield, A Tale of Two Cities, Great Expectations, and The Mystery of Edwin Drood. 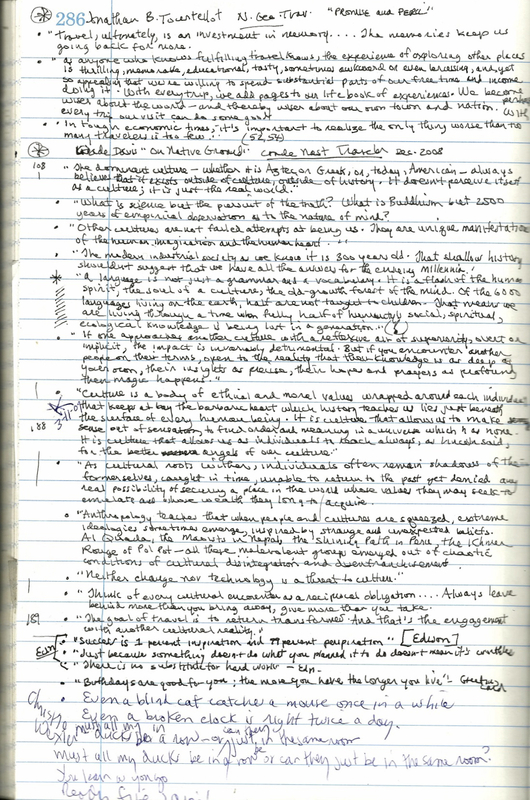 Yet something else happened during the writing of the little book: he learned a great deal about the difference between writing a lean cohesive book (written all at once) and writing the usually episodic, rambly, serialization book. As a result of this no man’s land between the hubris of his youth and the social conscience of his maturity, he was able to make it the rest of the way through his life without ever again seriously daring hubris. He was able to find out things about himself that stripped away some of his teflonish pride. And sorrow would rock him on his heels again and again. So it came to pass that in the last quarter of his life, in his 450 public readings (for fifteen long years, having an average of one public reading performance every twelve days), the story of Scrooge became as indispensable as singing the national anthem at a big league baseball game ‑‑ unthinkable to close without it. And as his life drew to a close, a higher and higher percentage of each evening performance was devoted to Christmas Carol and its lesson of agape love. It is no hyperbole to say that without this one little book, the life of Charles Dickens most likely would have been a very different story. In a very real sense, then, we may validly say that the characters ‑‑ children, if you will ‑‑ conceived by this author ended up by taking him on a long journey . . . that would take the rest of his life. And it is our privilege to be invited along. Welcome to the timeless world of Christmas Carol. I have always loved Christmas stories — especially the heart-tugging kind. And, let’s face it, sentiment and Christmas belong together. Of all the seasons of the year, the heart is openest to love, empathy, kindness, forgiveness, generosity, and change . . . at Christmas. Thousands of authors have written stories about Christmas, but sadly, most of them are shallow, sterile, and un-moving. These stories may be technically brilliant, but if they fail to engage the heart, I view them as failures. Only a few have written “great” Christmas stories, and even fewer have written “great” Christmas books (usually novelette length rather than full book length, as Christmas books are rarely very long). And of those few special Christmas books which percolate to the top, very very few manage to stay there, but gradually, over time, sink down into that vast subterranean sea of forgotten books. To stay alive, season after season, generation after generation, presupposes a magical ingredient no critic-scientist has ever been able to isolate. Just think about the ones that come to mind: The Christmas Carol, Miracle on 34th Street, Its a Wonderful Life, The Other Wise Man . . . , and, with these four, we begin to sputter and qualify. There are many others that come to mind, but none of them has been able to stay in the top ranks of Christmas Best Sellers. In recent years, The Best Christmas Pageant Ever by Barbara Robinson (1972) and Richard Paul Evans’ The Christmas Box (1993) have so far evidenced staying power, but only time will reveal whether they will stay there, for it is comparatively easy to stay alive for ten, twenty, even thirty years ‑‑, it is much much harder to remain vibrantly alive 40, 50, 60, 70, 80 years or more. But, none of this precludes comebacks. Literature and public taste are, after all, cyclical, thus even during authors’ lifetimes, reputations roll along on roller-coasters, undulating up and down as public tastes and demands change. No one remains hot forever. Along this serpentine track of survivors rumble authors such as Dickens, Dostoevsky, Hugo, Cooper, Scott, Stevenson, the Brontes, Twain, Cervantes, Tolstoy, Alcott, Shakespeare, Carroll, Chaucer, Defoe, Dante, Dumas, Eliot, Kipling, and Thoreau — these never go out of vogue. Once past the immortals, we move into a much more fluid field. Depending on many factors, recoveries and resurrections continue to take place. Usually because certain works brazenly dig into our memories and impudently refuse to leave. Which brings us to Abbie Farwell Brown. It was some years ago when I first “met” her. My wife and I were wandering around New England at the height of fall colors. Ah, autumn in New England! There are few experiences in life to match it. Among those few are New England used bookstores. 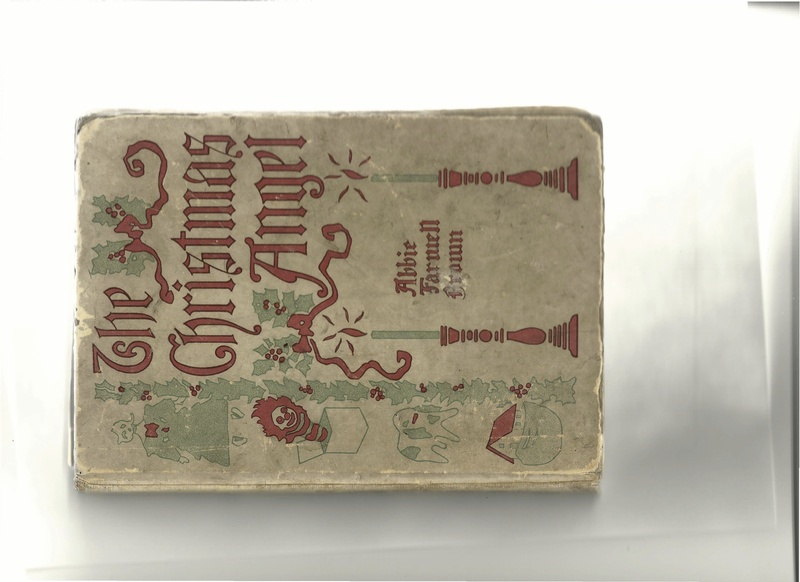 Well, it was in one of these that Connie discovered an old book — and short — with the intriguing title of The Christmas Angel. She brought it over to me and asked if I was familiar with it or with the author. I was not, but on the strength of the wonderful woodcut illustrations, we bought it. Upon our return home, I unpacked it, then sat down to read it — and LOVED it. Such velcro sticking power does it have that it has pummeled me until I am black and blue from its demanding to be brought back to the top, where it keeps telling me it belongs! It was there once, and liked it, but, through no fault of its own, readers who loved it died off, so it began its gradual descent into that ultimate oblivion. So here it is, if for no other reason than to rescue my battered body from its continuous pummeling. I don’t often creep out far enough on limbs to risk getting sawed off, but I shall make an exception for The Christmas Angel. I shall be really surprised if it does not claw its way back to the top — and stay there, this time. It has all the enduring qualities that has kept The Christmas Carol up there for over a century and a half — in fact, one manuscript reader told me, about a week ago, that she even prefers it over The Christmas Carol. It is one of those rarities: a book that should be loved equally by all generations — from small children to senior citizens. I can see it being filmed; and I can see it becoming a Christmas tradition: unthinkable to get through a Christmas season without reading it out loud to the family once again. Since the story is divided into 15 short chapters, it would lend itself to being spread out during the Advent or the Twelve days of Christmas. Having said that, I’ll prophesy that pressure to read on by the listeners might make a proposed time table difficult to stick with. And, unquestionably, the Reginald Birch illustrations add a very special dimension to the book. When Christ wished to hammer home a point, He told a story, a parable, an allegory — in fact, biblical writers tell us He never spoke without them. This is just such a story. But, coupled with that is something else: it is one of the most memorable and poignant Angel stories I have ever read. And it is amazing how many people today are rediscovering Angel stories! It has to do with Miss Terry — bitter, cold, bigoted, and unforgiving. As was true with Dickens’ Scrooge, in her life virtually all sentiment, caring, and love had been discarded, then trampled on, in her morose journey through the years. And now, at Christmas, but one tie to her past remains, one key that might unlock her cell block of isolation: her childhood box of toys. She determines to burn them, — every last one. It is my personal conviction that reading both books this Christmas season will result in one of the richest Christmas seasons you have ever known. And it will amaze me if you don’t end up loving The Christmas Angel at least as much as The Christmas Carol. 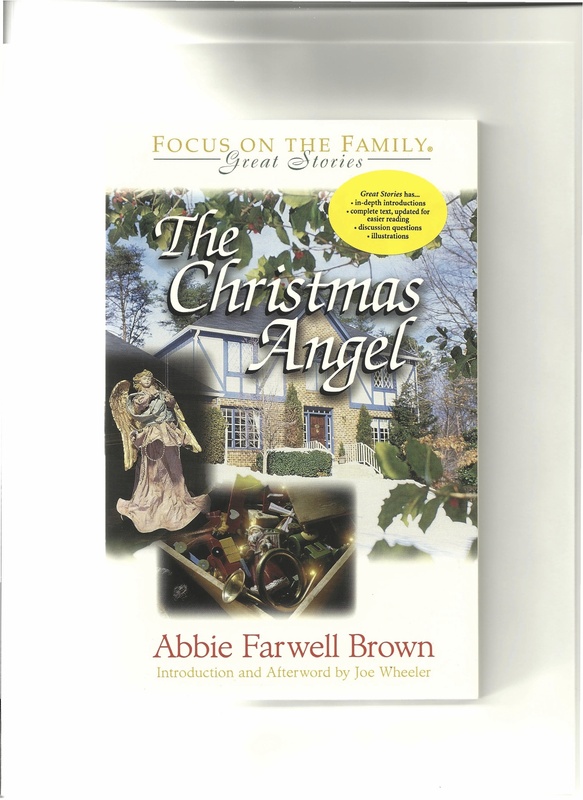 In my introduction/biography for The Christmas Angel I piece together Brown’s fascinating life story and list all her books and short stories. I’m guessing many of you will wish to track down and purchase her other books as well as this one. Be sure and journal each time you read from these books. More and more people keep expressing interest in The Book Club. When you notify us that you wish to join, please email that information to us so we can add you to the roster. If you feel uncomfortable posting your mailing address on the web, just drop it in the mail to me at P.O. Box 1246, Conifer, CO 80433. Send me your name, interests, reading preferences, and other items that will help me chart the direction of The Book Club. After securing a copy of each month’s book, be sure and journal each time you read from the book. 2. How is it different from other religion-based novels you’ve read? 3. Wright wrote three Social Gospel novels. Look up the term, then respond in terms of how the book incorporates the movement’s key elements. In other words, Christ, in His life on this earth, was not at all into doctrine or creeds, but rather into selfless service for others. So, did Wright pull it off? 4. Did reading this book have an impact on you personally? In what way? 5. Did reading the book make you want to read more Wright books? You will have no trouble finding a copy of Dickens The Christmas Carol, for it is one of the best-selling books of the nineteenth and twentieth centuries. But if you’d like to order my Focus/Tyndale edition, just write me at Box 1246, Conifer, CO 80433, or send me an email at “mountainauthor@gmail.com.” Should you wish me to inscribe any copies, just let me know—there will be no charge for that. The Christmas Angel is likely to be more difficult to secure, but again, I can supply you with a copy. PRICE: $16.99 each. However, if you alert me to your being a member of our book club, you can reduce it to $14.00 each. If you purchase both books, I’ll reduce the price to $25.00 total. Shipping will come to $6.00 extra. Next Wednesday, we’ll journey to Arches and Canyonlands National Parks. To the strains of Willie Nelson’s “On the Road Again, our intrepid little foursome resumed our odyssey in a black Lincoln Town Car (because it’s the only car with a trunk large enough to hold three weeks’ of luggage for four people, including books and “priceless” souvenir coffee mugs picked up along the way). We then pulled out of our long driveway onto Conifer Mountain Drive with Connie and Lucy ensconced in their backseat nests and Bob and I in the navigational cockpit. Over time, we’ve developed a system that works well for us: one of us navigates (drawing upon maps) and reads out loud, to front and back passengers, about the history of the parks and lodges we are driving towards. This way, when we actually arrive there, we know what is important or significant; this way it’s almost like coming to a loved home. We owe the dream of making the Great Circle to Ken Burns and his landmark National Parks miniseries on PBS. It was watching those riveting films that provided the impetus. The reference sources we rely on most heavily for these blogs are Ken Burns and Dayton Duncan’s The National Parks, Mel White’s Complete National Parks of the United States, and Christine Barnes’ definitive two-volume work, Great Lodges of the National Parks. Though I also refer to other works, these four books are our traveling reference bible. Our pattern has been to first read out loud sections dealing with the founding and preservation of the national park, landmark, monument, forest, etc., first, then follow it up with the equally fascinating story of these fascinating and fragile national park lodges. It has been gratifying to discover how many people vicariously travel with us via these blogs. Some readers will no doubt follow in our footsteps by themselves making the Great Circle circuit, and others will content themselves with a metaphorical, almost virtual, experience. Either way, we welcome you aboard. As we’d already discovered in our northwest national park peregrinations, invariably there were fascinating people who stepped in to preserve these natural wonders for us. All it seems to take are one or two local visionaries to do the spade work and two or three more to spearhead the project nationally. In the case of this particular park, as is true of virtually all other great national parks, one name towers above all others—John Muir. Without him, one shudders to think of the fate of all these magnificent parks we tend to take for granted. Second only in significance to Muir were Stephen Tyng Mather and his able associate, Horace Albright; this triad constitutes the founding fathers of our entire national park system, today the envy of the world. of Colorado residents back at the turn of the twentieth century were consumptives, each with a hacking cough that doomed them to an early death unless they managed to escape from the lowlands and settle in the brisk, invigorating, life-giving air of the mountains. Earlier on, a member of the European nobility, the fourth Earl of Dunraven, had purchased a large tract of land near Longs Peak. Object: to turn it into an exclusive hunting preserve for himself and his wealthy friends. But the Earl lacked staying power. Enter F. O. Stanley, a twin to his brother, Francis Edgar, born in Kingfield, Main. The brothers grew up, both entered the teaching profession but soon left it because of entrepreneurial ventures. In 1884, the brothers (both inventors) fine-tuned a new film process, called Stanley Dry Plate, that revolutionized photography. Eventually, in 1904, they’d sell it to George Eastman for $530,000. But long before that sale, the brothers had become so fascinated with the automobile and steam-propulsion that they created their first steam-propelled auto—it became known as the “Stanley Steamer.” They completed their first Steamer in 1897, and launched a new model in 1901. Two years later, F. O.’s doctor told him that he’d soon be dead of consumption unless he moved into the high mountains. So it was that F.O. and his wife, Flora, came to Denver; then, seeking higher yet ground, discovered Estes Park, which they promptly fell in love with. Constitutionally incapable of remaining inactive for long, Stanley purchased from Dunraven 160 acres of land adjacent to Estes Park. Object: to build on it a great hotel. Stanley then hired Denver architect, T. Robert Weiger, to implement his hotel plans. Weiger is also known as the designer of Denver’s iconic City and County Building. Ground was broken, fall of 1907. The Colonial Revival hotel (like Yellowstone Lake Hotel, one of the few surviving examples of neoclassical design in the wilds of the mountainous West), four stories high, was crowned by a two-layer hexagon-shaped bell tower, that has ever since been likened to a wedding gazebo atop a perfectly proportioned cake. It was flanked by perpendicular wings at each end, and graced by a long first floor veranda with six double sets of Doric columns and Palladian windows. Eight other separate buildings were added later. With the nearest railroad 22 miles down Big Thompson Canyon, Stanley improved the road and imported a fleet of Stanley Steamers and Stanley Wagons to ferry guests back and forth from the railroad. Because his auto-stage line proved so successful, Stanley is known today as “the father of auto-tourism in America.” And the elite of America and travelers from abroad came, with their maids and nannies. Came to this “first all electric hotel in the world” to play croquet on the front courtyard; read, chat, or dream on the veranda; take trail rides, play billiards, pool, or golf; attend concerts, vaudeville shows, balls; and be feted with fine dining (with one waiter per table). It put Estes Park on the map. Enos Mills, on the other hand, came from a very different background: the plains of Kansas. He moved here when only fourteen, dying of consumption. Like Stanley, here in the mountains, his health was restored. He would build a hotel facility that could not have been more different from Stanley’s: the plain-looking, almost primitive Longs Peak Inn, which took in summer guests who were willing to participate in Mills’ conservative spartan lifestyle: no drinking, dancing, or card-playing, but rather take strenuous hikes, study nature, and attend lectures (three times a week, given by Mills himself). Mills and Stanley soon discovered they shared a common passion: preserve for posterity those beautiful mountains they’d come to cherish. Mills, in a chance meeting with John Muir in San Francisco in 1899, caught a vision for his life work: to help bring the Rocky Mountains into the fledgling national park system. Mills and Stanley now enlisted the powerful support of Mather and Albright in Washington, D.C. A bill to create the park (at 265,800 acres, smaller than they wanted) was introduced in Congress in 1914. But unlike the stories of other national parks, it did not languish there—John Muir died. Because of Muir’s support for the park, and the sentiment generated by his passing, the bill was rushed through in only a month! It was dedicated on September 4, 1915, with both Mather and Albright in attendance. The way the final bill was drawn, the Stanley Hotel ended up a couple of miles outside the park. And thus was born Rocky Mountain National Park, which straddles the Continental Divide and includes more than sixty peaks 12,000 feet high or higher, 50 alpine lakes, 450 miles of streams and rivers, 355 miles of trails, and great diversity of habitat (given that its elevation ranges from a low of 7,840′ to a high of 14,259′ (Longs Peak). It is crossed by the legendary Trail Ridge Road, the highest continuous road in America (reaching 12,183′). Massive snowfalls keep it closed during winter, so it is only open from June 1 to October. The lower sections are open year-round. Not surprisingly, the park is one of our nation’s most popular tourist destinations. 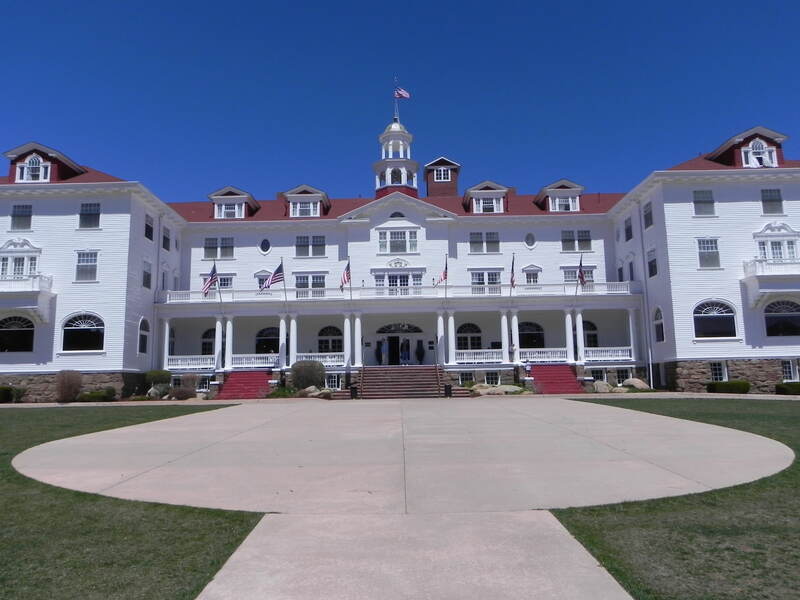 As for the Stanley Hotel, its very survival was for a long time in doubt. One man, Roe Emering, somehow kept it alive during the Great Depression of the 1930s. Even after selling the hotel, the Stanleys returned here every summer; here F.O. would sit on the veranda, gaze out at the majestic mountains, and dream. He died October 2, 1940 at the age of 91. From 1971-1995, the hotel ownership went through a soap opera series of events (time-share schemes, lawsuits, tax problems, closure, bankruptcy), but in 1995, Grand Heritage Hotels saved it, and has lovingly restored it to its former beauty. Today it is part of the National Trust’s Historic Hotels of America. And Stephen King provided extra survival insurance: while living in nearby Boulder, King and his family discovered the Stanley, and found in it the inspiration for a book he was then writing, The Shining. The movie, however, was filmed by Stanley Kubrick in England, with exterior shots taken at Oregon’s Timberline Lodge. In 1996, King decided to film a six-part miniseries—this time filmed at the Stanley. Since the restored lobby was now light and airy, King requested that it be repainted so as to give it a dark and sinister look; this was done. Not surprisingly, ghost stories were born in its wake, along with murder mystery dinners, Halloween balls, daily ghost and history tours (from the creepy basement to the cobwebby attic); and stories abound of creaking floorboards, tinkling pianos, scurrying ghost children, etc—but all agree that there is nothing sinister or evil here, given that even the ghosts appear to love coming back just to enjoy themselves. Connie and I remembered back to two special visits, first when a cavalcade of cars wound down from the mountains, preceded by police cars with flashing lights; soon the Emperor and Empress of Japan arrived, emerged, smiling their delight, and walked up the steps to the veranda only a few feet away from us. They were eager to be off into the high country to see and photograph places and vistas they’d only read about. The second was the night of Princess Diane’s funeral; Connie and I woke up in our room at 4 a.m., turned on the TV, and watched the pagentry until long past dawn. Now we checked in, hauled in our smallest suitcases, and walked downtown to meander through the shops and eat home-made ice cream. Later on, we drove into the park so Connie could get her national park passport book stamped, and Bob and Lucy could view an elk herd. Inside the Stanley, we played dominoes in a room adjacent to the bar. Later we became acquainted with a lovely waitress named Olga, from Hungary (most of her family had been killed in the Holocaust). She’s now taking Hotel Management courses at Denver University. Afterwards, we chatted by one of the great fireplaces on the first floor. Then we struck up a conversation with Ute (from Germany) at the front desk. She told us that over 150 weddings are held at the Stanley between Memorial Day and Labor Day. Also that lots of corporations hold retreats here; and that the employees come here from all over the world. In spite of it all, she said, it’s quieter here than one might think—even serene. Though the Stanley remains a formal hotel, it’s more comfortable than most—a great place in which to work. Then we snuggled down in our beds. 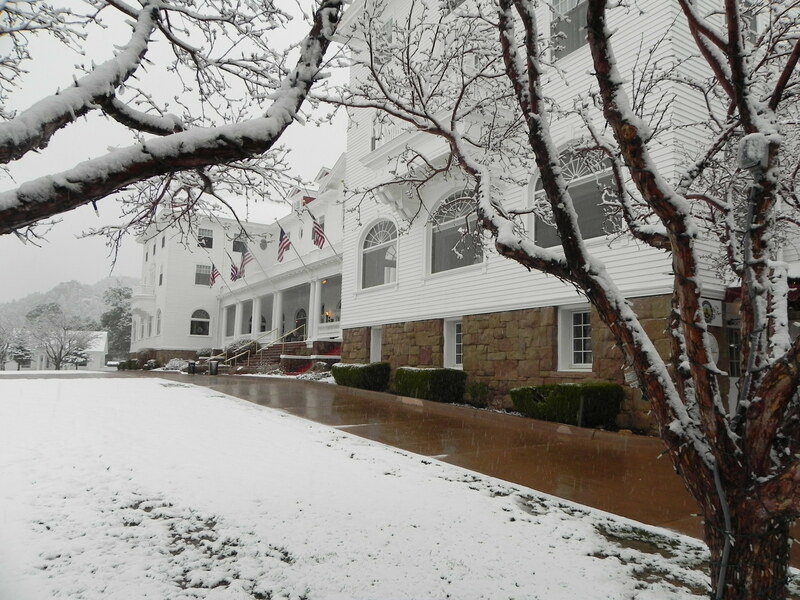 During the night, the wind battered the hundred-year-old hotel—and snow. For it was early in May. We fell asleep wondering how we’d make it over the pass the next day. The last thought, however: How grateful we all ought to be that this grand dame of the Rockies is still with us! Next Wednesday, we will sidetrack to the December Book of the Month. Barnes, Christine, Great Lodges of the National Parks, II (Portland, Oregon: Graphic Arts Books, 2008). I submit that one of the Seven Wonders of the Modern World has to be “The Great Circle” (by far the greatest concentration of magnificent national parks in the world). Although I have been making pilgrimages to them ever since my parents introduced them to me during my growing-up years, it took Ken Burns’ landmark PBS National Park Series to crystalize their significance to me. Up to that series, I had more or less just taken these national wonders for granted. Same for the legendary hotels and lodges that grace them. Shortly after the series had aired, we received a telephone call from our traveling partners in crime, Bob and Lucy Earp of Tennessee. Bob asked, “Did you watch the Ken Burns PBS National Park Series?” When we said “Yes,” he followed up by asking us what we thought of it. When we answered in the superlative, he asked what we thought of the idea of visiting the Northwest national parks and lodges after the 2010 Zane Grey’s West Society convention in Gold Beach, Oregon. And so it came about that we took in half of the Great Circle (most of them are national parks, monuments, or forests; some are national wonders we took in along the way). So early summer of 2010, we loaded up our rental Lincoln (with the deepest car trunk in the industry), and headed out, visiting Crater Lake and staying in Crater Lake Lodge, followed by Oregon Caves National Monument and the Oregon Caves Chateau. Those two were followed by Mt. Hood and Timberline Lodge; Mt. Ranier National Park and Paradise Inn; Lake Chelan, North Cascades National Park, and Stehekin Landing Resort; Leavenworth and Enzian Inn; Olympic National Park and Lake Quinault Lodge, also Lake Crescent Lodge; we visited the northern loop of the North Cascades National Park, followed by Grand Coulee Dam; then Yellowstone National Park and Old Faithful Inn, also Lake Yellowstone Lodge; Grand Teton National Park and Jackson Lake Lodge; then Glacier National Park and Glacier Park Lodge, Many Glacier Hotel, Prince of Wales Hotel; and we visited Lake McDonald Lodge. Should you be interested in vicariously traveling with us and visiting each of those parks and lodges, you can scan back through our archived blogs starting August 4, 2010 through February 9, 2011. 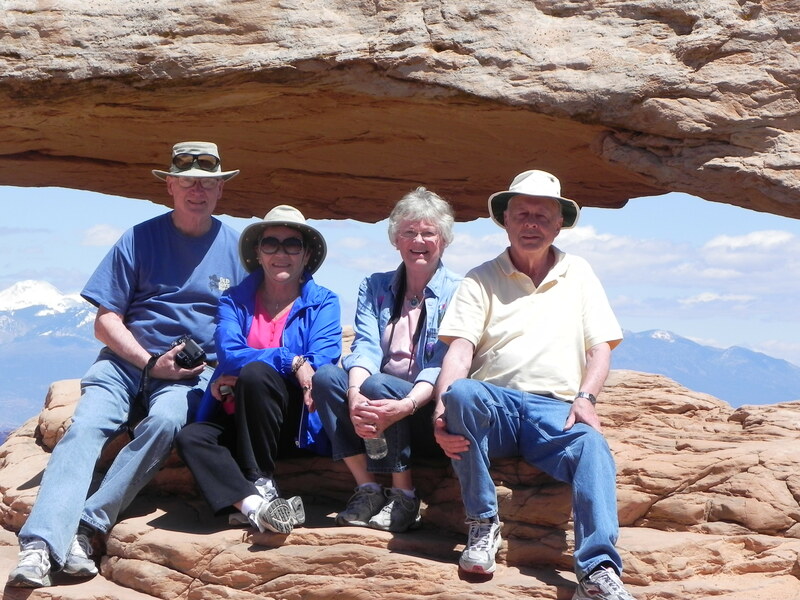 In late spring of 2011, we completed the Great Circle by visiting the Southwest National Parks. We will begin that trek next Wednesday. We will be visiting Rocky Mountain National Park, Arches National Park, Canyonlands National Park, Capitol Reefs National Park, Bryce National Park, Zion National Park, North Rim and South Rim of the Grand Canyon National Park, Death Valley National Park, Sequoia National Park, Kings Canyon National Park, Yosemite National Park, Lake Tahoe, the Loneliest Road in America (Highway 50), and Great Basin National Park. 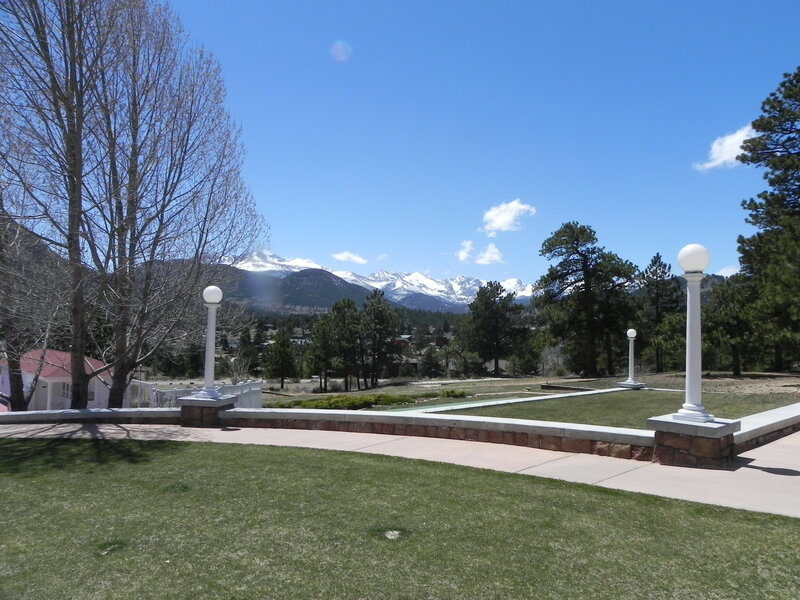 In each blog, we will cover the story of how the park or monument came to be preserved, how the lodge or hotel came to be constructed and preserved, and our reactions to each park and lodge. When we did the Northwest Parks, they were generally uninterrupted; this time there will be more breaks for other topics, but sooner or later, all will be chronicled for our armchair readers. The snow is falling again as I write these words. Another reason for living in the Colorado Rockies. In fact, the two seasons are slugging it out, as the golden aspens (at peak only a week ago) are clearly reluctant to surrender the field to the forces of winter, but they have no choice in the matter given that each season is as inexorable as incoming and receding tides. We’ve been waiting almost half a year for this moment: when once again it is safe to build a fire in our moss rock fireplace. If the truth must be told, when we moved back to Colorado in 1996, the real estate agent had been given a list of 30 priorities (what we valued most in our new home). At the top were: It should feature serenity, a view we’d never tire of, lots of snow, and a wood-burning fireplace. Today we get to revel in all four. Our daughter Michelle and agent, Greg Johnson, joined forces two years ago to drag, kicking and screaming all the way, this dinosaur of the ink and paper age, into the new digital age. “You must blog! Thus was born the weekly blog, Wednesdays with Dr. Joe,” which has continued unbroken even during that hellish period when an unscrupulous predator hacked into our world and shut us down. We have no idea how many readers we lost during that traumatic period. What I have discovered is that blogging is such a new construct that there are few entrenched norms—unlike tweets where a Procrustean Bed of 140 spaces preclude deviation length-wise. As you have discovered, I joined the ranks of those who prefer the longer format. It’s really much like the weekly column I wrote once, “Professor Creakygate,” for the students attending Southwestern Adventist University. Once you establish a rhythm, it’s just a matter of not breaking it. Given my penchant for longer blog series (the Northwest National Parks, the Southern Caribbean, the Zane Grey convention in Virginia, the Trembling World, and the upcoming series on the Southwest National Parks), I have discovered that long series where I dwell on a subject for months at a time can put my voice into a straitjacket which precludes me from speaking out on hot current issues. Because of this, I hereby announce that this time, expect periodic breaks; but rest assured, always I will afterwards resume the series topic. I held back as long as I possibly could—until my agent held my feet to the fire long enough to risk ignition—on adding the tweet dimension to our lives. On October 1, I started daily tweets, concentrating on quotations chosen from a half century of collecting (hundreds of thousands). Not just quotations, but quotations that help make sense of this thing called “life.” Speaking just for myself, this hectic life we live virtually guarantees that we will break down unless we turn to a Higher Power than ourselves and also seek wisdom from others who have learned much from the batterings of the years. These hard-earned nuggets of thought and insights end up providing us with just enough strength and courage to face each day. Changes of pace too, for without changes of pace (such as humor) in our thought-processes, we become warped or petrified. During my 34 years in the classroom, one aspect was a constant: a thought written with chalk on the blackboard each day. My students looked forward to something new that greeted them each time they came in the door. Also, I have since discovered that many of them copied those quotes into their notebooks and have lived with them ever since. I’m an avid collector of quotation compendiums. Some few I find worth the price; many, if not most, are not (merely quotations flung onto paper, without regard to their relative power or effectiveness). I don’t know about you, but what I hunger for most are quotes that make me think, that make me re-evaluate my own habits and inter-relationships, that end up making me a different and better person than I was before. I also realize that we are each fighting off electronic strangulation; so much so that we try something new with great reluctance. It is my earnest desire that you will find these tweets worth the time it takes to check them out each day. Our old world (paper and ink-driven) is changing by the nanosecond. While books are likely to always be with us, they will never reign supreme as they have during the last six centuries. Like it or not, electronic books will continue to expand their reach. What this means is that the old templates will no longer work like they once did. Your persona is no longer captureable just in traditional print. But rather, you owe it to your “tribe” [people who are kind enough to listen to what you write and what you say] to speak out about life and values multidimensionally: through paper and ink books [75 so far], through public speaking, through media appearances on radio and TV and book-signings, through your blogs, through your tweets, and through all the plethora of new communication technologies. Only by keeping up with all this as best you can, can your unique voice (your persona) have any chance of remaining alive during coming months and years. And since I do wish to stay in contact with all of you, I am committed to continuing to create books (traditional and electronic), blogs, and tweets. Do let me know if all I’ve articulated in this blog makes any kind of sense to you. Next week, we will transition through the abstraction of travel toward the Southwest parks and lodges.